At Kraus Orthodontics, we treat adults as well as children and teens. Does your self-esteem suffer because of crooked teeth or other dental problems? It’s never too late for orthodontics, no matter what your age! We see more and more adults every year, and we want to help you get the stunning smile you want. When your smile is straight and improves your appearance, your confidence level gets a nice boost. Your social life and career can benefit from a renewed self-assurance. If your bite is aligned, your speech will improve and any pain experienced when chewing food can be resolved. Straight teeth are also generally in better health because they are easier to clean, which means fewer cavities! Allen orthodontist Dr. Kraus and his team are ready to talk to you about all of your orthodontic needs. We provide braces, Invisalign, and underbite and overbite correction. Confidence | Adults are often conscious of their appearance, and a renewed smile can give you more confidence. When you like the way you look, you might be more positive and smile more often. Success | When patients love their new smiles, the higher confidence they have can help put them in situations where they are more successful. An attractive smile could open more doors for your career and give you the assurance you need to be impressive. Health | Patients with straight teeth have fewer dental problems. Your teeth should be easier to clean after your adult orthodontic treatment. With fewer cavities and a better bite, you can feel comfortable with the look and feel of your smile. Beauty | We want you to feel good about smiling when you meet people. Most people will notice a beautiful, eye-catching smile. Comfort | When your teeth are straight, you will chew and speak with ease. All of the discomfort and pain from having a crooked smile will be gone with our adult orthodontics treatment. We offer meaningful and effective treatments for our adult patients in Allen and the surrounding areas. At Kraus Orthodontics, you can choose from several orthodontics procedures, including Invisalign, traditional braces, or AcceleDent to achieve a movie-star smile! Overbite Correction | With overbite correction, we can realign your teeth so you can feel more comfortable and look amazing. Our treatments are personalized specifically for you so you can have the best smile possible. Underbite Correction | To improve the aesthetic of your smile and the health of your teeth, talk to use about underbite correction. You’re never too late to treat an underbite misalignment. The orthodontist will work with you to find out you individual needs. Missing Incisors Treatment | Sometimes a congenital condition can keep your teeth from growing in when they should, or you might have lost a tooth because of infection or other issue. We can talk to you about straightening your teeth and show you some tooth replacement options. At any given time in 2015, about four million Americans wore braces. With their increasing popularity, you might see quite a few adults wearing orthodontic treatments. Braces need to be worn for about 24 months to achieve the maximum effect, and are still the best choice for complex dental issues. They don’t need any extra attention from you, besides keeping up with your brushing and flossing. If you decide on Invisalign braces, we will take a 3D image of your teeth to create a mold. The digital imaging will give you the custom-made aligner trays designed exactly for your teeth. 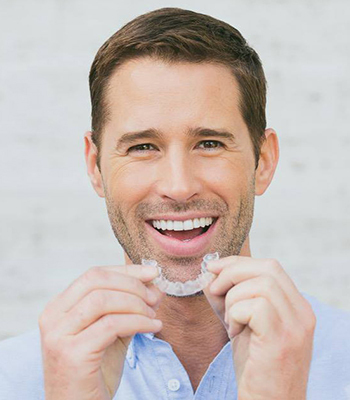 The clear aligners are BPA-free, and are virtually undetectable by other people. The Invisalign braces tend to cost more than traditional braces, however, and may not work with bridges or other existing dental work. Invisalign is also limited by certain types of misalignments, including teeth that have come in sideways or at an angle. Fortunately, Dr. Kraus will be able to examine your teeth and help you determine with orthodontic option is right for you. Overbite and Overjet | When you have an overbite, the top incisors protrude too far forward over the bottom teeth when the jaw is closed. The bottom teeth are sometimes completely obstructed in some patients. An “overjet” happens when the top teeth project forward over the bottom teeth. Both overbites and overjets can also cause jaw pain. Underbite | Think of an underbite as opposite of an overbite. When the jaw closes, the bottom teeth extend beyond the top teeth. Underbites can cause speech problems, pain, and damage to your teeth. An underbite can also be caused by teeth missing from the top of the mouth. Replacement of Missing Incisors | Occasionally patients have missing incisors due to genetics or the effect of their environment. Teeth can also fall out because of gum disease or when a tooth gets knocked out. We know a missing tooth can make a person feel self-conscious, but the empty space can also result in shifting and other teeth alignment problems. We are ready with the know-how and technology to repair all of these problems, including anterior open bite and additional situations. At our office in Allen, TX, we are excited to help you attain the smile you want. Reinventing your smile can help with both aesthetic and functional issues. Call us today to find out more about our adult orthodontics or if you have any questions. You can also contact us here.